THE leadership of the Boko Haram sect, has said that it is willing to cease fire and stop all atrocities being perpetrated by the group if the state and Federal Governments will truly heed to its demands. The acclaimed spokesman of the sect, Abu Mohammed Ibn Abdulazeez, who doubles as the second-in-command (Amir) to its leader, Imam Abubakar Shekau, in a tele-conference with journalists in Maiduguri on Thursday said that if the state and the federal government want the group to cease fire completely, former Borno State governor, Ali Modu Sheriff, must be arrested and prosecuted according to the law of the land. 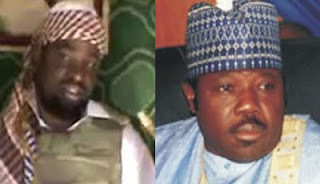 He also said that apart from the arrest of Senator Ali Modu Sheriff, government should compensate the sect and rebuild the sect’s places of worship which were destroyed during the 2009 uprising. Abdulazeez further stressed that,all sect members who were arrested and are under the custody of security agencies must be released with immediate effect, while all their wives who were displaced following the crises as well as their children must be rehabilitated into the society to allow room for much talked about dialogue with the Federal Government and the sect. Abdulazeez also said that the sect has mandated five members to mediate on its behalf. They are himself (Abu Mohammed Abdulazeez), Abu Abbas, Sheikh Ibrahim Yusuf, Sheikh Sani Kontogora and Mamman Nur. While speaking on the series of killings and wanton destruction of properties perpetrated recently in Maiduguri, Abdulazeez disssociated the sect from such acts, pointing out that they were politically motivated by those seeking power in the Borno Emirate council, government or elsewhere but not for the ideology of the sect which is fighting for the cause of Allah. He also said that the burning of old and newly constructed primary schools witnessed across the state was not masterminded by the sect, insisting that the burning of such places was carried out by aggrieved politicians who were denied contracts from the state government. In another development, Amnesty International has said that Nigeria is illegally holding hundreds of people, suspected of participating in violence perpetrated by Boko Haram and is denying them access to lawyers. Amnesty International alleged in a report released on Thursday that most of those imprisoned around the country are held without criminal charges. Some of the suspects in detention have been summarily executed by security forces before facing trial, the London-based Amnesty said. The group also said some of those detained told its researchers they were shackled for days, forced to sit in their own excreta in overcrowded cells, while watching other prisoners get beaten and coerced into confessions. Boko Haram has been blamed for the killings of hundreds of Nigerians. Many of its attacks have targeted places of worship, often churches. Amnesty blamed both the Federal Government and Boko Haram in the report for likely committing crimes against humanity as the guerrilla conflict engulfing the North continues to kill civilians. “You cannot protect people by abusing human rights and you cannot achieve security by creating insecurity,” Salil Shetty, secretary-general of the group, said at the launch of the report in Abuja. “There is a vicious cycle of violence currently taking place in Nigeria,” the report stated. “The Nigerian people are trapped in the middle,” it added. However, security forces routinely deny committing abuses, though the country has a long history of abuses and so-called extrajudicial killings being carried out by police officers and soldiers. Colonel Mohammed Yerima, a military spokesman, said soldiers do hold prisoners, but only to do a “thorough job” investigating their backgrounds. He said some people had falsely reported neighbours as Boko Haram members out of petty disputes. The Amnesty report comes as both the Federal Government and Boko Haram face increasing international condemnation. Violence blamed on Boko Haram has killed more than 720 people this year, according to an Associated Press count, making 2012 the deadliest year since the sect began its attacks in 2009. A Human Rights Watch report in October also accused Nigerian security forces and Boko Haram of likely committing crimes against humanity in their fighting. Meanwhile, the Federal Government has denied the report by Amnesty International which indicted the country of having engaged in extrajudicial killings through its security forces. While receiving the Secretary-General of the group, Mr Salic Shetty, accompanied by Mr Eduard Nazarski (Director of Amnesty in the Netherlands), Mr Chris Crawshaw (Director of the Office of the Secretary-General), Ms Lucy Freeman (Interim Deputy Director – Africa Programme) and Mr Makmid Kamara (West Africa Researcher, Africa Programme) during the presentation of the report entitled “Nigeria: Trapped in the Circle of Violence,” Minister of Foreign Affairs, Ambassador Olugbenga Ashiru denied allegations of mass extra-judicial killings and argued that the security forces have been very restrained in their response to the complex challenge posed by the insurgents, many of who, he stated, remained faceless and brutal in their tactics.